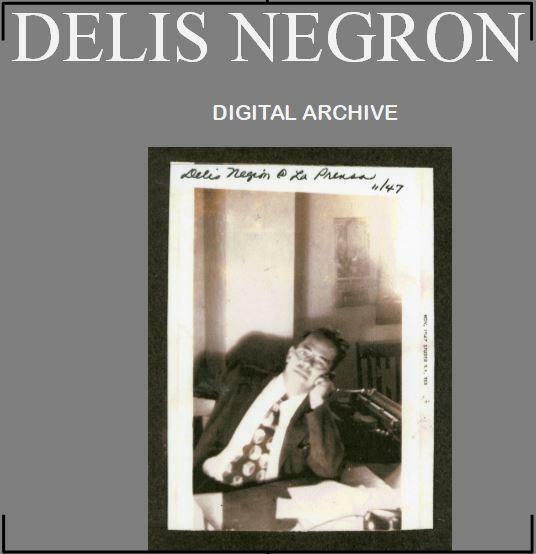 The Delis Negrón Digital Archive captures the life and legacy of Delis Negrón, born in 1901 in Toa Alta, Puerto Rico, and who was director, editor, poet, writer, translator, English professor and activist during his residence in the United States and Mexico City during the first half of the twentieth century. Delis Negrón’s literary production can be traced through newspapers and literary work published in the United States and Mexico and at cultural events of cities across the state of Texas during the first half of the 20th century. He worked for the newspaper El Demócrata which was under the direction of the historian Don Vito Alessio Robles and for El Universal in Mexico City. After his residency in the Mexican capital, Negrón continued his journalism career in south Texas. He met his wife, Adela Aguilar, in Laredo where they settled and formed their family as he continued to make a name for himself in the journalism world. He was an editor for the Laredo Times, he founded El Día in Laredo in 1941 and ended his career as the director of editing of the Spanish newspaper La Prensa of San Antonio, Texas. The Negrón collection represents one of the many efforts led by Recovering the United States Hispanic Literary Heritage to recuperate, preserve and make visible the histories of the Latino population in the United States, which until the present lacks representation in the social, cultural, political and historical areas. This collection not only accesses a particular history of immigration and political involvement, but, in a broader sense, it is a step in the reconstruction of the intellectual history of Latinas and Latinos in the United States and their continuous contributions to the political, cultural and social contingencies of the country, along with their transnational ties. This archive provides documentation that prevents its exclusion, often perpetuated in the manipulations of history that leave colonies such as Puerto Rico or countries like Mexico with inferior roles. The recognition of the importance of this archive by the Negrón family has made possible the writer’s visibility and allows these links to be made with his work. The efforts in this archive reflect the participation of one (im)migrant’s trajectory at a transnational level, representing the figurative and literal movement of people and documents beyond borders. Negrón’s archive not only breaks with the stereotype of (im)migrants and Latinos in the United States, but he also adds to the literary and cultural identity of Puerto Ricans in the United States. Vicki Ruiz describes, “Contrary to popular media depictions of Latinos as people who arrived the day before yesterday, there exists a rich layering of nationalities, generations, and experiences” that have shaped and continue to develop the American experience in the United States (672). With this in mind, this archive contributes to making the history of the Americas inclusive providing another aspect of the local and transnational history and heritage that Negrón participated in. For this reason, the website was designed in an organic manner to encourage individual, unique and multidisciplinary interpretations by those that make use of the documents provided in this digital archive. With the material exhibited in the digital repository, other projects can be initiated. This project is a work in collaboration with Graduate Research Assistants: Isis Campos, Sylvia Fernández (Team Leader), Victoria Moreno and Annette Zapata. Under the umbrella of Recovering the US Hispanic Literary Heritage and US Latina/o Digital Humanities. Greatly appreciate the support and consultation of the Negrón family. During the upcoming weeks, Recovery's blog will feature the RA's reflections on the project. Additionally, on Delis Negrón Digital Archive under the Reflection Section, you can find the Negrón family reflections related to the memories they have of/with Delis Negrón.